Jessica is taking the MET police to court in a civil case, she is also a Core Participant in the Undercover Policing Inquiry. Jessica has requested anonymity; this has been upheld by the courts. ‘Jessica’ is a pseudonym. 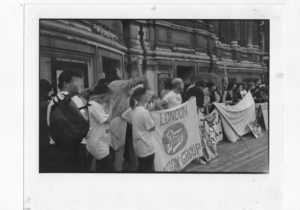 The year before – whilst at college my best friend and I would come up to London on the train every Saturday (that was all we could afford) to leaflet the likes of Boots and McDonalds with Hackney and Islington Animal Rights. We were also involved with London Greenpeace, London Boots Action Group and other groups that were around at the time. Once we had moved to London we were able to get more involved with the protests. I can’t remember when I first met Andy, many of us were involved in multiple campaigns and met up frequently. He was a visitor to our house and I thought of him as a friend with similar interests, morals and opinions. I had no idea that he had any special feeling toward me, I certainly never felt any for him. Looking back, knowing what I know now, he wasn’t like the other undercover officers in many ways, he was very much in the background. He lacked the charisma of some and he was only included by default: people needed transport and he was always there and willing. Although I was 19, I had never been in a proper relationship before. Events in my life had taught me it’s best to keep people at arm’s length. So I didn’t know how to react when he made advances towards me. I was embarrassed, awkward, and what truly makes me feel sick now, is that I didn’t want to hurt his feelings. I look back now and realise I was naive, idealistic, unsophisticated and a very young 19. Appallingly I also now know my new “boyfriend” was a 32 year old, married, undercover policeman working for the SDS, Special Demonstration Squad. I had believed him to be about 24 at the time. One of the few things he told me about himself was that he had a 2 year old daughter that he never saw, which was a lie. His wife had their first daughter the year after we split up. At the time of writing this I have only known his true identity for about a month, so it is still early days. Although not legally under age, I feel that my youth and vulnerability were used to target me. I was groomed by someone much older, and far more experienced (he had been an acting police officer for 10 years) and I was manipulated into having a sexual relationship with him. I didn’t even know his real name. We were “together” for over a year although part of that time I was working abroad, and coming back to stay with him. I later learned that he had made several approaches to other women, some whilst I was away, but they were older than I was and knocked him back. I never knew he had the reputation amongst women as “being lecherous” and “not nice to be around”. I remained faithful to him the whole time I was away, as far as I was concerned I had a boyfriend back in London. We had actually split up by the time he came to “go abroad and find himself”. The one who missed him most was his rescue dog that he left behind. This has been one of the most stressful times I have ever known: my life as I knew it was a lie. One of the people that I trusted most never existed. I can’t look back at those times in the same way now. I can’t trust my judgement, because I got things so wrong. I am now beginning to look at people I know differently. I can’t even feel that I’m being paranoid, because it’s justified. The police, in their apology, acknowledge our human rights were violated. By simply telling my story, I suffer a further violation. In exposing this undercover officer for what he is, what he did, I will have to sacrifice myself again. This is a story that has to be told, has to be prevented from happening again. I am not the first person to go through this, and unfortunately, I will not be the last. We don’t know the full scale of the abuse at the hands of the undercover police. So far as we know, I was their youngest victim, but in a secret squad that were a law unto themselves, unanswerable to anyone and seemingly untouchable, who knows what depravity was deemed acceptable. I attended my first demonstration at 14 years old, I am just grateful I never met him then. May 2017 – Jessica made a statement, on revealing her relationship with Andy Coles to the media, and a second statement one shortly after he resigned his post as Cambridgeshire Deputy Police and Crime Commissioner. May 2017 – On revealing their relationship, she gave an interview for the Guardian, and her story was televised on Channel 4. Anglia media were interested in the local aspect and she gave an interview to ITV. June 2017 – Jessica bravely gave an interview on the Radio 4 Eddie Mair Interview. Jessica is keen that Andy Coles is forced to resign from his position as Tory Councillor in Peterborough. A campaign calling for his resignation has started. The Campaign, based in Peterborough and supported by local people, is called ‘Sack Andy Coles’. September 2017 – alongside supporters from the ‘Sack Andy Coles’ campaign, Jessica took the courage to speak at a public meeting (film clip above). The campaign has gathered momentum with demos happening outside council meetings and door to door leafleting in his ward. She was interviewed for this article in February 2018. She also spoke out with other women at the Lush Summit. Jessica was invited to speak inside Peterborough Town Hall as part of the annual Women’s Day Festival, on 10 March 2018. She was interviewed for this piece, published on 19 March 2018, the day that the UCPI finally confirmed that Andy Coles was ‘HN2’ and revealed that he was the author of the ‘TradeCraft Manual‘ used by the SDS in the 1990s. June 2018 – Jessica released a Lush podcast, telling her story. Other women have come forward to tell us about their experiences with ‘Andy Davey‘ – including Emily Johns, a peace activist (who was involved in Active Resistance to the Roots Of War, ARROW, which Coles appears to have infiltrated first, in 1991) and ‘Joy‘, who met him slightly later. Despite this growing pile of damning evidence, Coles has decided to deny any wrongdoing, and refuse to make any further public comment. He is not the only former spycop to have lied about the past, and complained about the public’s demands for accountability. The truth has an unfortunate tendency to come out, as he is bound to discover.